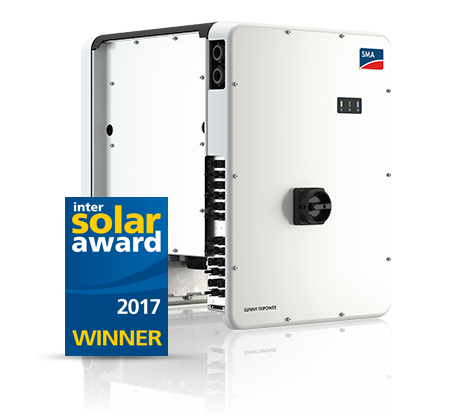 The new Sunny Boy 1.5 / 2.5 is the perfect inverter for customers with small PV systems. Thanks to its broad input voltage range of 80 V to 600 V, its versatility, flexibility in module compatibility and low weight for easy installation are impressive. After smooth commissioning via WebUI, the Sunny Boy 1.5 / 2.5 is ideal for local monitoring via the device’s own wireless home network or for online monitoring with Sunny Portal or Sunny Places. More communicative, easier to use and more efficient than ever: this Sunny Boy is setting new standards in inverter technology. A modern graphic display, readout of daily values even after sunset, simplified installation concept and wireless communication via Bluetooth®: The new Sunny Boys fulfill every wish. With the new OptiTrac Global Peak shade management and an optimal efficiency of 97 %, the inverters ensure optimum solar yield. As transformerless, multi-string devices, the Sunny Boy 4000TL and 5000TL provide maximum flexibility for plant design, and are the first choice for demanding generator designs. summary, when it comes to system design in the 5 to 12 kW power classes, the Sunny Tripower is the optimum product solution – for applications ranging from use in your own home and larger PV rooftop systems to implementation of smaller-scale PV farms. More durable than its predecessors: The new Sunny Island impresses with its high protection class and wide temperature range. Moisture, dust and temperature fluctuations won’t impair its operation, even after 20 years. Thanks to OptiCool, there’s no need to compromise when it comes to overload capacity and economic viability. And there’s more: OptiPower, the intelligent load and energy management system, ensures operation even in critical situations. OptiUse makes installation, commissioning and daily use easier than ever with automatic rotary field detection, an optimized quick configuration guide and intuitive operation. And the intelligent OptiBat battery management system automatically controls the most important charging and discharging procedures, which extends the service life of sensitive energy storage. Sunny Island is a truly comprehensive package for a worry-free, reliable and self-sufficient electricity supply. because systems with the Sunny Boy Storage can be flexibly extended at any time on both the generator and battery sides. The new 50kW ‘Sunny Tripower Core 1’ is here in Australia.